Neoclassical sculptor William Rush was responsible for a majority of the artwork commissioned for the Fairmount Water Works in 1815. But as the Fairmount Water Works began its decline during the late 19th century, Rush’s sculptures were removed one by one and placed in storage or displayed by the Philadelphia Museum of Art. 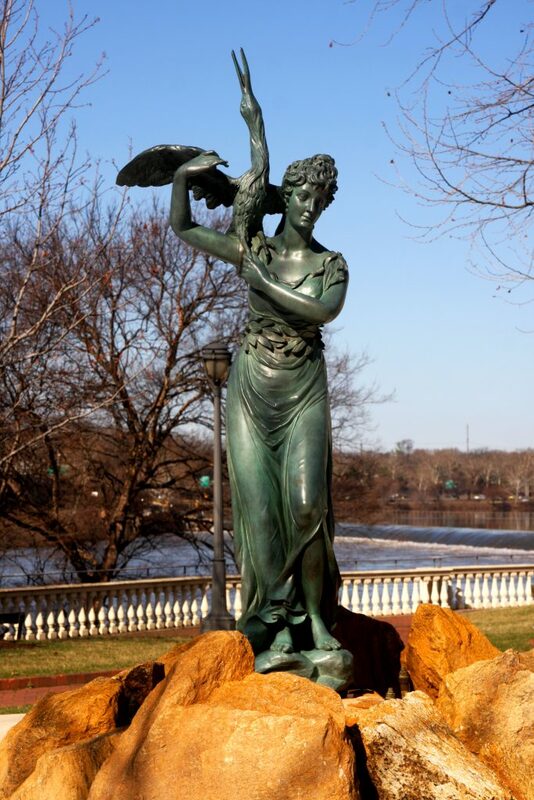 Mercury was removed from its spot on top of the Mercury Pavilion in the late 1800s, and the Allegory of the Schuylkill River (Nymph and Bittern) followed in 1937, leaving its spot at the South Garden’s Central Marble Fountain. The Conservancy worked with Philadelphia Parks & Recreation, Mark B. Thompson Associates LLC, the Philadelphia Museum of Art, and Stratton Sculpture Studios to replicate Rush’s sculptures and install them at their original locations at Fairmount Water Works. To learn more about this replication process, click here.